Qualifying the GATE Exam would not only get you a seat in IITs/NITs/IISC for higher education/PG, but also a job in PSUs (Public Sector Undertakings). And that is why this exam has become so important. If you have landed on this page, then you are definitely serious about the exam. And trust me, you won’t regret it. Everyone is going to gain something from this page. We’ll divide our 60 days preparation strategy into four phases of '15 day' each. Most of you will stop here seeing the length of this article. But if you go through this complete article, and strictly follow the plan, I’m sure that you’ll be able to crack the exam with a good rank. So let’s start. Dont forget to bookmark this page (Ctrl+D) if you wanna come back later. Also like our facebook page to stay in touch, and get the updates directly into your news feed. See the Syllabus: Although you might be familiar with the syllabus of GATE and the important subjects for the exam, but it’s time to get precise. So before starting the preparation, you need to go through the latest syllabus and do a little analysis and research on the marks distribution of each subject in the examination. Time Allocation: After the analysis of the syllabus, you’ll find that there are some subjects which are more important from marks distribution point of view. So you need to give extra focus and time allocation to them. Plan your time: Now that the GATE exam date is so near, you don’t want to waste a single day. So you need to organize your time, energy and resources in the best possible manner. Make a smart schedule for your preparation. You should allocate your study hours during the time of the day when you feel that you can study with maximum efficiency and give your best. It’s also recommended to study with maximum efforts at that time of the day, during which the GATE Exam will be conducted. Study Material: Collect all the standard and relevant books which cover your syllabus. Get the previous years’ solved questions collection of last 10 years. Also get some sample papers based on the examination pattern. Fundamentals: When preparing for GATE exam, it’s very important to clear your fundamentals / basic concepts. You can understand the importance of basics if you see the last years’ papers. So in these first 15 days, give maximum focus to the fundamentals. Read: Read as much as you can in the starting days. Because as the exam date approaches, it will be more significant to solve more and more questions. So if you feel that there are areas where you need to allocate time for thorough study, and then do it in the first 15 days. However avoid giving too much time on one particular area. Short Notes and Formulas: Make short notes of important formulas and concepts. And revise them as often as possible. But I repeat again that please manage your time properly. Keep in mind that you have to revise your complete syllabus in these 15 days. Avoid distractions: I don’t need to tell you that this is one of the most critical time periods of your career. It’s the time to focus on the career. So better avoid any kind distractions, otherwise you will be fooling yourself. Relevant Questions: Understand the fact that you need to invest your time in those questions and numericals only, which are relevant to the exam. Just solving a lot of questions of random nature will not help. Refer to the pattern of questions asked in previous years and focus on those types of questions. Time management: Plan your time properly. Dedicate maximum possible time to studies and preparation. Keep a clock in front while you solve the questions. Target to solve each question in fixed limit of time. Revise the Notes: Make a habit to revise your notes daily. Assign at least 1 hour daily for this. If you face doubts in some particular area, you can refer back to the main content. Take a test every 3 days: You are now in the third phase of your 60 day plan. And now it’s time to start working rigorously. In these 15 days you should start giving a test based on the standard GATE pattern. Give at least one test daily. Previous Year Papers: Remember you need to use mock test papers for the daily tests that you give in this period, and save the original previous year papers for the fourth phase of preparation. However you can use a few original papers also in this period, to get a real idea of what kind of questions are asked. Also keep in mind that the examination pattern has changed for the next year. So go through ‘What's New in GATE 2014’ if you have not. Still Revise the Notes: Never stop this. Revision is very important. It’s not possible to read something and learn it forever, in one go. You need to revise it again and again. So continue the 1 hour daily revision practice. Tests and more tests: Welcome to the final phase of preparation. At this stage, the most important thing is to give more and more tests, and solve more and more questions. Tests will help you the most. Aptitude: Don't ignore the aptitude part. 15 % of the paper consists of Aptitude + English alone. So give some time to this part also. It will help you score some very easy marks. Computer based Exam: You know that the GATE is to be conducted online from next year. Ensure that you are comfortable with the computers, so that you can appear for the online examination with the ease without any complications. Proper Routine: Follow a good healthy routine in the last 15 days. Have a good night’s sleep daily and a balanced diet. Be Positive: Be positive and confident. Avoid stress. Have faith in yourself and God. Your hard work and efforts will surely pay off. Take a healthy diet and a lot of fruit juices. Give a rest to your mind and body and relax for a while. However, keep solving a few questions which will help you maintain a flow. Carry Documents: Ensure that you are carrying the important documents, such as Hall Ticket, to the Examination Hall. Avoid guessing: Don’t attempt the questions, which you don’t know. Stats show that it is quite unlikely to score marks by guessing and will most probably result in negative marking. Check the options: Sometimes you can obtain the answer by simply checking the options. It improves your speed and saves time for attempting more questions. Time Management: Manage and plan your time very efficiently. It’s better to solve more number of easy questions as compared to attempting a few tough questions. That’s all from my side. 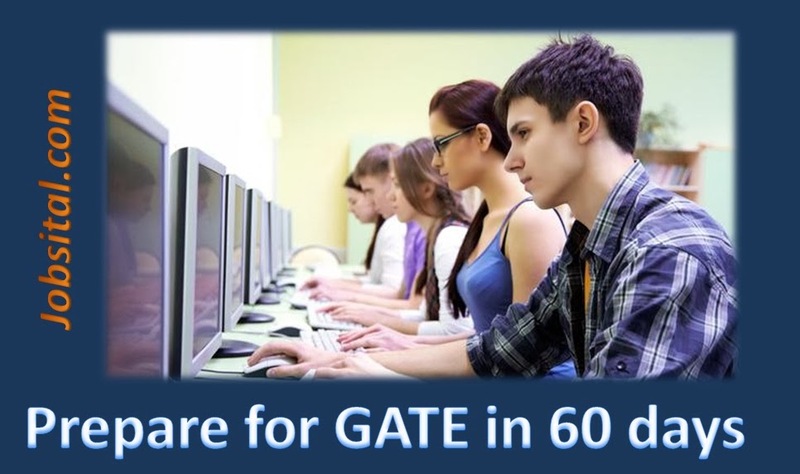 I’m sure this article will help you in securing a good rank In GATE Exam. So start working with complete dedication. All the Best! If you like this article, please share it by clicking on the facebook or twitter button below. I'm glad that it helped, thanks for stopping by.. All the best! most welcome @Smiley.. All the best! glad to help you.. All the best! Tricks don't work. Talent works, Hard work works. Hard work beats talent only when talent doesn't work hard. So you must be either talented or hard worker. If you are not any of them then there is no way, no tricks, You are just a loser and you will always be. Hey Naruto, thanks for stopping by.. It's true that there's no shortcut to success. And the 2 months preparation plan that we're talking about, really requires hard work and dedication. But the thing is, most of us give up in the beginning itself. However, it's not as hard as it seems, and the sincere efforts of a person will surely make him successful. Thank You so much! This is the best strategy for late-comers. It really helped me release the stress on being late for starting the preparation! Good Job! Thanks again! happy to help you.. All the best for your Exam! Thank you Santosh.. glad to help you, All the best! most welcome Ankita.. All the best! me out a lot. I hope to offer something back and aid others such as you aided me. I mean, what you say is valuable and all. But think about if you added some great visuals or videos to give your posts more, "pop"! hard to argue wwith you (not thaat I personally will need to…HaHa). You certainly put a new spin on a subject that's been discussed for years. Thanks for sharing your thoughts about custom t-shirts. Thanks, All the best for your future! I am very much impressive for the way you plan....now i am ready to start,this article helps me alot..thank you soo much. I am agree with you. Thanks for the post. It was very inspiring post. Hey, Thanks for stopping by.. I visited your site, and it's really great! Thanks for the post you gave very nice information about GATE. Really it was very inspiring. Please post some GATE 2016 mock test. Thanks. Really appreciate your suggestion. Will let you know when it's published. Please make sure to like our facebook page for important updates. I appreciate your work here. You have one very nice work the information you have share with use is very useful to ua and it will be very helpful to crack GATE exam. Please keep delivering further updates related to GATE exam. This article is by far the best motivation I have encountered. Now I can begin with some confidence. Thank you for your sincere efforts in building up this article.